Ok, let me see a show of hands of how many people have commented on a post, image or video only to be inundated with a barrage of notifications from everyone else that has commented? 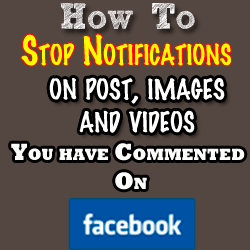 In this quick walk through I’ll show you how you can turn off those notifications so you can get back to commenting on your friends and family’s post’s. In order to stop the notifications on post’s you may have commented on you simply click on the down arrow located to the right of the post and then select Stop Notifications. Note: I tried going to my sister’s timeline to find this post and stop the notifications but I was not able to. I could only get the above options if I clicked on my notification icon and chose the notification that let me know she had commented on it. You can do this one of two ways ~ when you see the post in your newsfeed use the little down arrow to the right of the post (just like in the above image) and select Stop Notifications or you can click on the image itself and under the text of the image you’ll see Stop Notifications. There you have it, no more excuses as to why you don’t comment. So what are you waiting for? Go comment away with ease and be a blessing to someone.